Join the exclusive Avondale Members Club today. 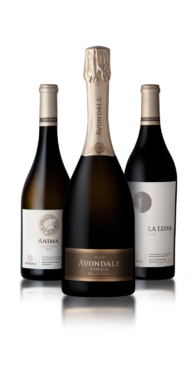 Through the Avondale Members Club, we exclusively reward our loyal friends and family who take great pleasure in our wines and stay connected in our Circle of Life. Please choose your selection of 6 wines to get started. We are inspired to hand-craft our premium quality wines so that we ultimately offer wine-lovers an extraordinary experience approved by Mother Nature. Through the Avondale Members Club we exclusively reward our loyal friends and family who stay connected in our Circle of Life by taking great pleasure in our wines.